Irregular. Was intended to be published quarterly but during some periods couldn’t meet its financial exigencies and went unpublished. 6.5″ x 9″. Approx. 300 pages. Each issue broke up the work by section: poetry, prose, reviews, comments, miscellany. Sept. 1932 issue added title, “Surrealist number,” guest editor André Breton, with contributions from Giorgio di Chirico, Salvador Dali, Paul Eluard, Yves Tanguy, Tristan Tzara, and others. Vol. 1 No. 2 features a supplement, “Antheil musical supplement.” First issue dedicated to Ezra Pound and features a photo of the poet by Man Ray. New York: Kraus Reprint Co., 1967. 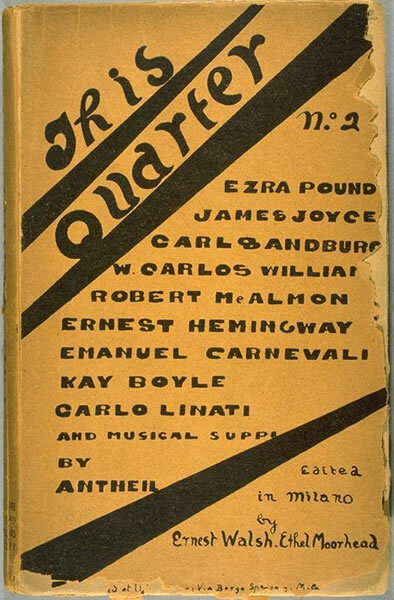 The first issue of This Quarter praised Ezra Pound, “who by his creative work, his editorship of several magazines, his helpful friendship for young and unknown artists, his many and untiring efforts to win better appreciation of what is first-rate in art comes first to our mind as meriting the gratitude of this generation.” Walsh received contributions from him, as well as his other literary heroes: William Carlos Williams, Gertrude Stein, James Joyce, and finally Ernest Hemingway, who also helped in the printing and editing of early issues. Walsh’s interactions with the literary world were not always pleasant. Owing perhaps to their volatile personalities and the close working arrangement, Walsh and Hemingway eventually had a falling out. In his memoir A Moveable Feast Hemingway documented the scuffle in a chapter titled “The Man who was Marked for Death,” in which he described how Walsh told Hemingway that he had won the $1000 writing prize but that he never actually presented the money as promised. This Quarter attracted a great deal of press due to its libertarian editorial policy and its denunciation of literary periodicals like The Dial (“its influence on young writers is insidious”), The Criterion (“a tradition without individuality”) and The Little Review (“too trivial to discuss”) (Hoffman 82). Moorhead suspended the periodical’s publication following Walsh’s death to tuberculosis until Edward Titus became the new editor in 1929. His effort to steer the magazine in a new, more conservative, direction forfeited much of This Quarter’s appeal. The periodical suffered from inadequate financing and a lack of strong leadership in the wake of Walsh’s death, and its final issue hit newsstands in late 1932. Before it became insolvent, however, it fostered an environment of freedom for the author and set the stage for Modernist writers like Hemingway to print in more mainstream periodicals. Though This Quarter never issued a formal manifesto, Walsh made a number of proclamations as to the magazine’s purpose. The magazine hoped to offer encouragement to rather than interference with new writers. An expatriate American poet and coeditor of This Quarter, Ernest Walsh was diagnosed as tubercular at seventeen. He spent several years in a sanatorium in Lake Saranac, New York before being discharged, supposedly cured. Following a brief stint in the military, Walsh met Ethel Moorhead, a suffragette who provided the necessary capital to launch This Quarter, which intended to “publish the artist’s work while it [was] still fresh.” Walsh edited the first two issues before passing away from complications related to his disease. Before joining Ernest Walsh as an editor for This Quarter, Ethel Moorhead was a suffragette active in the Women’s Social and Political Union (WSPU). As a participant in the 1912 WSPU London window-smashing campaign, she faced nearly constant arrests. Like the other militants in the union, she exercised hunger strikes in order to get released from prison under the Cat and Mouse Act, and when sent home to recover from double pneumonia in 1914 she escaped to France. There she met the ailing Ernest Walsh, and travelled with him throughout north Africa and Europe. She assisted in the financing and administration of This Quarter until Walsh’s death and Ernest Hemingway’s departure in 1926, at which point she assumed full control of the magazine until Edward Titus took over. Expatriate American journalist Edward Titus was an editor for This Quarter and the founder of Black Mannequin Press. While living in London he married cosmetic mogul Helena Rubinstein in 1908 and fathered two children with her before the family fled Europe for Greenwich, Connecticut at the outbreak of World War I. They returned to Paris in 1918, and Titus began publishing D. H. Lawrence and other modernists through his Press. His marriage was faltering by the time he started editing This Quarterdue, according to his wife, to her obsession with her business. During Moorhead’s hiatus from 1929-1932 Titus published more conservative works in This Quarter than its previous editors had. Allen, Charles. “Regionalism and the Little Magazines.” College English 7:1 (1945). Crawford, Elizabeth. The Women’s Suffrage Movement: A Reference Guide, 1866 – 1928. UK: Routledge, 2001. 423 – 426. Image, cover May 1925. This Quarter. Accessed from “Apprenticeship and Paris.” 10 Sept. 2002. Department of Rare Books and Special Collections. University of South Carolina. 13 July 2009. Image, cover Autumn 1925 – Winter 1926. “Ernest Hemingway In His Time: Appearing in the Little Magazine.” 18 Nov. 2003.Special Collections Department. University of Delaware Library. 22 July 2009. Joost, Nicholas. Ernest Hemingway and the Little Magazines: The Paris Years. Barre, MA: Barre Publishers, 1968. Kenney, Alma L. “Rubenstein, Helena, Dec. 25 1870 – April 1, 1965.” Notable American Women: The Modern Period. Cambridge, MA: Harvard UP, 1980. Credo Reference. Davidson College Library, Davidson, NC. 7 July 2009. Knight, Donald. “Dictionary of Literary Biography on Ernest Walsh.” BookRags. 2005. 8 May 2007.